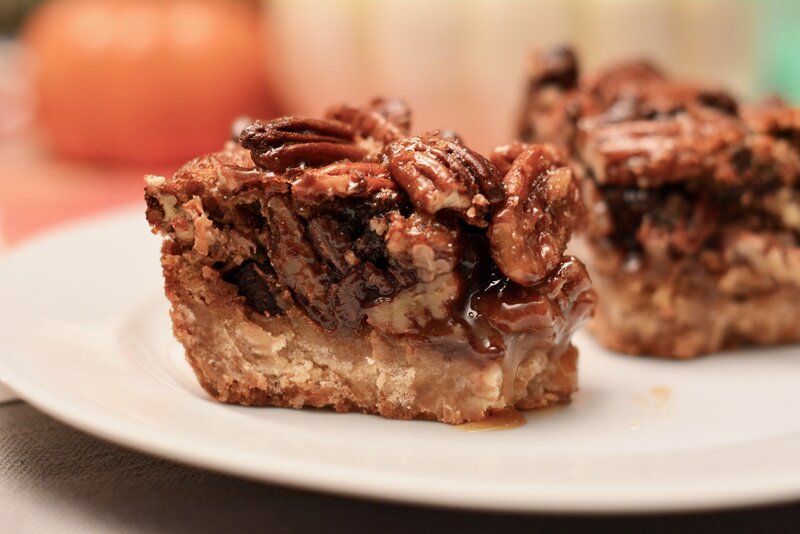 I’m ditching classic pecan pie this year for pecan pie bars. See, while the pie has been a holiday tradition in my family for years, (it started with my grandmother’s Thanksgiving) my kids don’t seem to love pecan pie as much as I do. 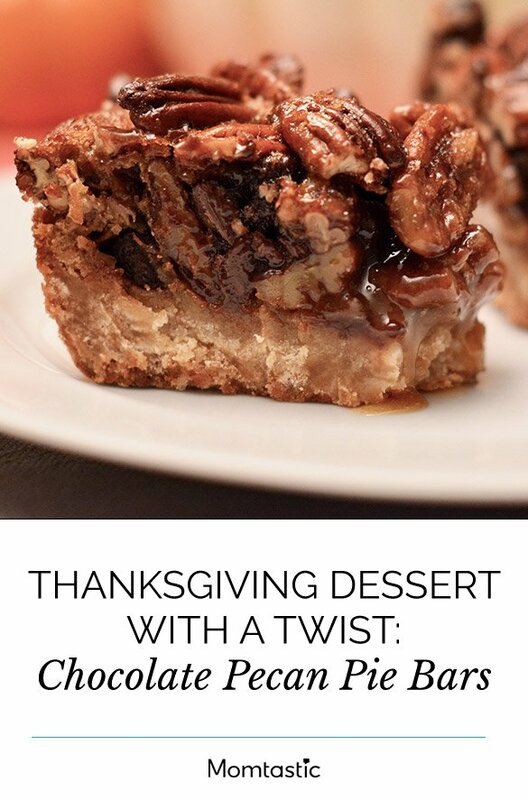 So I’ve come up wth the ultimate chocolate pecan pie bars. 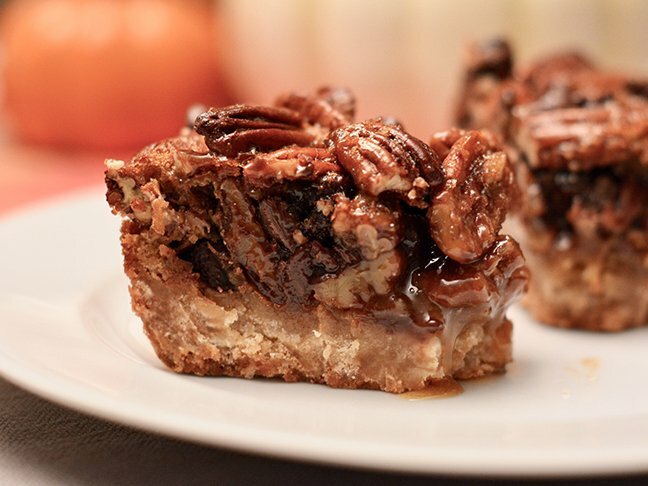 The bars are like cookies (with all the goodness of pie! ), and they’re simple to serve. I swirl the chocolate chips right into the batter so they get gooey in the middle, and stay whole on top. Step 1: Heat the oven to 350 degrees F. Liberally butter the bottom and side of an 8-inch square baking dish and set aside. Step 2: With an electric mixer fitted with a paddle attachment, beat the butter and light brown sugar on high speed in a large bowl until light and fluffy, about 3 minutes. Step 3: Lower the speed to low and mix in 2 cups of flour and 1/2 teaspoon of the salt until just combined. Step 4: Transfer the soft dough to the prepared baking dish and press it evenly into the bottom of the pan with your fingertips. Bake the crust for 13 to 15 minutes, or until lightly golden around the edges. Remove from the oven and allow to cool. Step 5: Wipe out the mixing bowl with a paper towel. Place the eggs, dark brown sugar, corn syrup, and vanilla in the bowl and beat with the electric mixer on medium speed until smooth, scraping down the bowl so that all the ingredients are combined. Then beat in the remaining 1 tablespoon of flour and the remaining 1/2 teaspoon of salt until well blended. Step 6: Stir together the chocolate chips and pecans in a small bowl, then arrange them evenly on top of the cooled crust. Pour the filling evenly over them, tilting the pan as necessary and smoothing the top with a spatula. Step 7: Bake the bars for 35 to 40 minutes, or until the top is puffed and golden brown and the middle is set. Allow to cool completely before serving.